Lose up to 1 wrinkle grade in 28 days* Using the Wrinkle reader inside the box Step 1: Match your wrinkles to the closest image. Note the grade down. 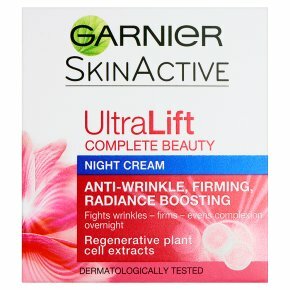 Step 2: Apply UltraLift Complete Beauty Night Cream everyday for 28 days. Step 3: Repeat step 1 and discover the results! See the results for yourself! Wrinkles appear reduced: up to -1 grade*. Skin looks smoother, as if uncreased for 92% of women* Skin looks visibly younger for 73% of women*. *Consumer test on 52 women for 28 days.